Day 133: Under The Tuscan Sun – We Wish . . . There is something special about Italian wines. We can’t quite put our fingers on it, but we’re guessing that the wine coming from Italia is getting better and better. This ISN’T Riunite! This isn’t CELLA LAMBRUSCO! Thank Goodness!! Except that Jean would tell you that when in college (yes, way back when it was legal to partake at the ripe ole age of 18) that she and her dorm friends thought they were pretty cool enjoying a glass of Lambrusco with their home made spaghetti on Sunday nights when the cafeteria was closed up tight. You know, when you hit Friday nights, sometimes it’s hard to be able to just sit down and enjoy a glass of wine at face value. Whether you’ve been in the car for an extended period of time (like Jean has been) or are working on an exciting project for early May (like Brian is), Friday nights are tough nights to kick back and relax. When you factor in the rain we received this week, there is no dry wood to start a fire in the pit; the deck is too damp to enjoy any time outside and there’s a pretty good chance that the rain we did receive helped bring the mosquitoes out of their dormancy! We still laugh at the age – old wise tale about giving Brian a six-pack of beer and putting him in a corner at your next outdoor party. He’ll draw the mosquitoes away from your guests and they’ll thank you for it! Yep, Brian is a MAJOR mosquito attractor. Not sure where it came from, but his Dad, Hugh was the same way–if there was a mosquito in the house, chances are it found either Hugh or Brian or BOTH! To this day, Brian can hear the high-pitched sound of a mosquito in the middle of the night and when he does, forget about getting any sleep–either it gets ‘nailed’ or Brian finds a new place to catch some sleep! Tonight we FINALLY broke into a bottle of wine that we’ve held onto since August when Twin Liquors had their 75th Anniversary sale. This little Italian wine has been nothing short of phenomenal to the nose, the taste and the finish. It’s an all around wine that we decided–early on–needed to be de-cantered to maximize the flavor and aroma perfection. A great nose of earthiness and subtle cherries punctuated by a nutmeg overtone. It’s a darker wine than we’re used to from Italy–laced with smoke, earthiness grilled herbs, black cherries and an array of darker aromas and flavors. This tough as nails, intense Morellino di Scansano Riserva 2006 Tempo, Terre di Talamo will require a measure of patience, something that we don’t always have. Make no mistake about it, this is a serious wine. 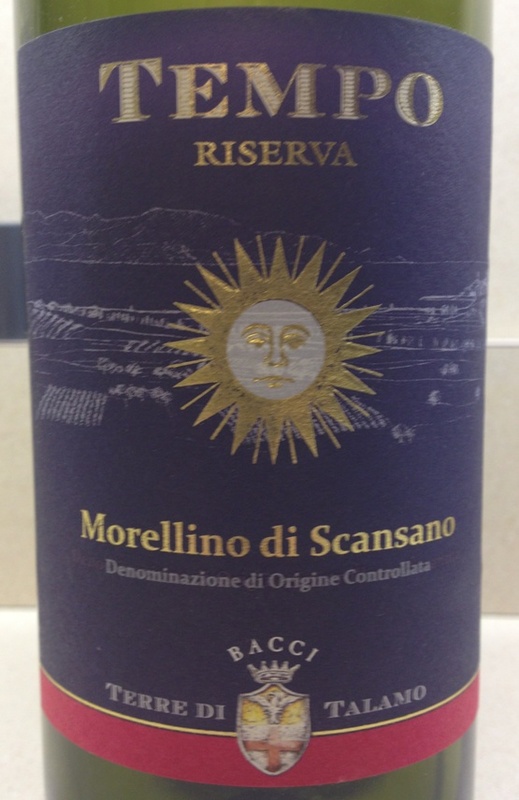 The Riserva is 90% Sangiovese, 5% Alicante, 5% Cabernet Sauvignon. At under $20 this wine is an AMAZING value!! Truthfully, we couldn’t have been more surprised. The longer it sat in the decanter, the smoother, and silkier the wine became. And, what a terrific combination of grapes to give this Italian blend the chops to stand in with beef, salmon, roasted potatoes and much more–clearly, a wine meant for food. From what we’ve learned about this little gem, Wine Advocate rates this one at 91 points and if you can get your hands on a 2006, grab it and as many of them as you can stock. You won’t be disappointed. As Friday gives way to Saturday, we hope that you’ll stop along the way to enjoy a really good glass of wine. By this time tomorrow, we’ll enjoying a variety of wines as good friends from north and west of us come calling for an evening of cooking and taking care of business! Until tomorrow, please enjoy your favorite wine responsibly and remember to recycle whenever possible! Categories: Uncategorized | Tags: Alicante, cabernet Sauvignon, Cella Lambrusco 2006 Tempo, decanter, Friday Night, italian Wine, Morellino di Scansano Riserva, Terre di Talamo | Permalink.